The Kelly-Rakin Hemostatic Forceps, 6.5" long straight. Kelly forceps also available either curved or straight with the 5-1/2" length, but these are bigger and more robust just as the regular Kelly forceps are not so delicate as the mosquito forceps. All are stainless steel and floor grade which means it is for regular use, not an operating room. Imported. This page refers to the 6.5" Kelly-Rakin Straight Forceps. 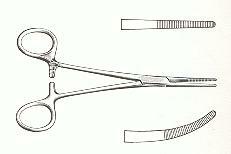 To get the 6.5" Kelly-Rakin Curved Forceps, click here.